‘The Walking Dead’ Season 5 Finale Review – Who Died, W Marks Explained, and The Return of a Fan-Favorite Character! The season 5 finale of The Walking Dead has finally aired, clearing up a lot of loose ends. This review of the finale episode of TWD season 5 has tons of spoilers for those who haven’t seen the last episode. Many questions will be answered, like – “Who died on ‘The Walking Dead’?” and “Will Morgan ever return?” The long-teased W marks are also explained, so grab a sandwich and get ready for some spoilers. The show opens with a shot of an abandoned car. For several teasing seconds, viewers see the smashed vehicle before Morgan is shown sleeping inside. It was a smart move to open with his return; the fan-favorite character has been teased throughout the show since his last full appearance in ‘Clear’. The next scene shows Morgan making some breakfast, before a dark figure appears out of the woods. The man, bearing a giant W mark on his head, sits down with Morgan. They have a chat that’s almost friendly, but the dirty and W emblazoned man is pointing a gun at Morgan. The conversation quickly turns into the deranged man informing Morgan he is going to take everything, including his life. He confesses that he and his fellow wolves scavenge, taking what they want, setting traps, and killing along the way. Morgan attempts to reason, but a second man ambushes him from behind. Morgan dodges, and they begin to put up a fight until Morgan busts out a 6-foot walking stick and wields it like an apocalyptic Jedi. The wolves are quickly downed, and Morgan attempts to use the gun to take out a few walkers, but pulls the trigger and discovers there are no bullets. To me, this signals the wolves are running low on supplies and getting even more desperate…and dangerous. Morgan doesn’t kill them and it isn’t alarming, but his choice will become a big deal later on. Daryl rides his motorcycle down a road, Aaron trailing behind in a car. You’d think the noise of the bike would draw every walker in a half-mile radius, but it doesn’t. Chalk it up to Norman Reedus on a motorcycle – eye candy for the ladies who love Daryl Dixon. 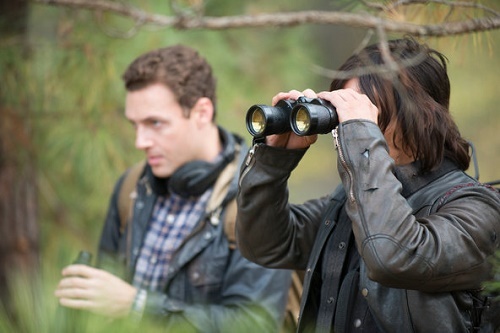 In the brief appearance, Daryl stops along the road, and he and Aaron duck into the woods. Rick wakes, bandaged and bruised from his fight with Pete. He laughs to himself, and Michonne asks about his smirk from the dark corner. Deanna has instructed he be tucked away after his crazy rant that makes sense to the group and viewers, but simply scared the Alexandrians. In this scene, we also learn that Pete has been moved to a new house, freeing Jessie. Rick returns to his house, tension still flowing between himself and Michonne. She is clearly still in the honeymoon stage of finding the Safety Zone, while Rick sees the weaknesses and knows Alexandria is a huge target for the evil lurking outside the walls. Rick brushes her off and makes a slightly demented Plan B if the community opts to kick him out. Let’s just say there is throat slitting involved. What’s concerning is how blasé Rick is about taking the town so violently. The attitude is so similar to The Governor and after The Walking Dead dragged out that plot (far too long), it’s unsettling in many different ways. Maggie, Deanna, and Reg have a small chat in which Maggie insists that kicking Rick out “won’t work.” Perhaps she knows Rick will go nuttier than squirrel poo and take the town. Or maybe she is attempting to secure her place in this mini-government. Deanna shuts her down, but Reg pulls her aside and assures her he will make the effort in smoothing the path. Sasha makes an appearance. We see her dragging walkers into a mass grave after killing several in the previous episode. Slipping into the grave, she stops and lays down on the pile of corpses. There is something disgusting yet serene about this moment. She closes her eyes and relaxes as the camera zooms upwards. Daryl and Aaron are still tracking through the woods, and Daryl asks about the time people were kicked out of Alexandria. Aaron blames himself for making a mistake by inviting them in, but confirms two men and one woman were driven out away from Alexandria and given one day’s worth of food and water. Take note of this tale. It’s believed that it might be a big part of season six of The Walking Dead. A few quick scenes follow: Daryl and Aaron track a man in a red poncho, Rick surfaces in town to exchange shady stares with Deanna, and Nicholas stalks Glenn as he and Maggie have a quick chat and assure each other of their love. Father Gabriel leaves Alexandria. The guard tries to get him to take a gun, but Gabe responds that God is all the protection he needs. If the show’s goal is to make viewers think, “UGH, this guy!” Mission completed. Rick and Carl reunite post-Pete-fight. Carl has been taking care of Judith and at first their reunion is sweet. Carl doesn’t hold any sort of grudge to his father knocking him away, which is refreshing for his character. He also doesn’t bat an eye when Rick refuses to let him attend the town meeting on the grounds he might have to kill a few people. This scene is a fantastic testament to the development of Carl. He’s grown from a little twerp who won’t stay in the damn house to a pivotal character who has transformed – similar to Carol. Carol pays Pete a visit under the ruse of getting him to check on Tara. She threatens him with a casserole and knife, enjoying her power of being hardened by her abusive ex, Ed, and her time outside the safety walls. She dares him to attack her, “Come at me. No? Yes? No.” Pete, clearly teetering on the edge of crazy, drops the casserole and wanders through his new home yelling, “This isn’t my house!” after Carol sashays out the door. Glen, wandering after Nicholas who he saw scaling the wall, stumbles upon a freshly mutilated walker. It’s a distraction as a shot rings out and hits Glen in the shoulder. Nicholas jumps out into the open to find Glenn is gone, but left a trail of blood. Daryl and Aaron, still trapped in the car, have a moment. Daryl pulls out at cigarette and laughs to himself. He confesses to Aaron that being trapped by walkers and looking at death, still feels better than being in Alexandria. Aaron gets Daryl and assures him he understands. He also informs Daryl he is the reason why the group was invited to Alexandria. After witnessing him being a loner, but so protective of his group during the melee in the barn, Aaron was positive he needed Daryl and the group. Morgan declines the invite to safety and asks for directions instead. Handing the map marked with Abraham’s note stating the world is going to need Rick Grimes, Daryl puts Morgan’s friendship with Rick together. Gabriel is out on his solo, gun-free adventure and finds a walker feasting on a body. He walks toward the zombie, arms outstretched, saying, “I’m ready.” The walker abandons the body, stumbling toward Father Gabriel who then uses the noose around its neck and a rock to finish kill it. He then turns on the still twitching, half-eaten body and finishes it off with the rock. Father Gabe returns from his odd “walk” and leaves the gate to Alexandria open after the guard asks him to close it. It makes one question – Did Father Gabriel leave the gate open on purpose? As the season six finale of The Walking Dead’ finale wraps up, a series of quick-clips play out, conveying the situations are all happening in time, together…. Rick, dressed in his Constable gear, notices the gate is open and flesh is lodged in the lock. Father Gabriel finds Sasha in the church asking for his help. He darkly refuses. The town meeting begins without Rick, Daryl, Aaron, Glenn, and Gabriel. Rick sprints down the street, hearing a dog barking wildly. Sasha and Father Gabe begin to talk, but he quickly baits her by telling her Bob’s death was her fault and a punishment for her sins. Rick finds the walkers that have breached Alexandria. Michonne speaks at the meeting on behalf of Rick. Sasha and Father Gabriel begin to fight, throwing punches, and screaming at each other. Glenn, still alive, knocks Nicholas out. Carol speaks at the meeting, assuring everyone they need Rick. Rick begins to fight the small pack of walkers, bench pressing one by the throat. Abe speaks on Rick’s behalf, assuring the town Rick is a leader who knows his…stuff. The Wolves bring Red Poncho Guy to their lair – the food distribution center full of traps that nearly killed Daryl and Aaron. As they arrive, they promptly kill Red Poncho Guy. Maggie speaks up for Rick, noting he had her father’s approval. However, Deanna jumps in to to share Father Gabriel’s confession. Jessie quickly counters that Gabe isn’t at the meeting and it’s hearsay. Glenn is about to kill Nicholas, crying and screaming at him, gun pressed into his forehead. Nicholas begs Glenn to spare his life. Identically, Sasha has Father Gabriel at gun point, but he is begging her to kill him. The wolves flick a switch that starts a light show and music that lures the walkers back into the trucks, resetting the trap. Rick flops the walker body on the ground, interrupting the I HATE RICK GRIMES meeting. He explains this is what is going to happen and they need him and the group. Maggie walks into the makeshift church, stopping Sasha from putting a bullet in Gabe’s head. Rick makes a big speech playing over clips of Glenn and Nicholas walking back to Alexandria together, Maggie, Sasha, and Father Gabriel praying together, and a Wolf looking through pictures. Rick confesses, “I was thinking about many of you I’d have to kill to save you.” He also refuses to apologize for the incident with Pete and what he said. Michonne closes the show by attempting to hang her sword back. She pauses and sheathes it upon her back. The game has changed…again. For more The Walking Dead spoilers, follow the link: The Walking Dead season 6 spoilers. The Walking Dead Spoilers Season 5 Finale: Will Daryl Dixon Die, Major Death Revealed in Promos? The Walking Dead Season 5 Spoilers: Will Rick Find Love Again, and With Whom? The Walking Dead Season 5 Spoilers: Who Does Carol Kill In The Finale Episode – Does Carol Die?